The Lair of Filth: Drawn and Quartered - The One Who Lurks - Review + Album Stream. Drawn and Quartered - The One Who Lurks. From Seattle, Washington, Drawn and Quartered initially began in 1993 as a project of guitarist Kelley Kuciemba under the name Plague Bearer and during the same year vocalist Herb Burke joined along with other members. The band released their debut demo entitled ‘Bubonic Death’ in the same year, featuring music that was entirely written by Kelley prior to the band’s formation. The band’s name was soon changed to Drawn and Quartered but, along with Herb, they continued to use the name Plague Bearer to continue Kelley’s musical project. Drawn and Quartered continued to release music and to date has quite a comprehensive discography including six full length albums, four demos, two EP’s and a DVD. The DVD featured no less than thirty four tracks, thirty one of which were recorded live during Drawn and Quartered's extensive touring schedule with the remaining three tracks being music videos. Drawn and Quartered’s seventh album, ‘The One Who Lurks,’ has just been released on CD and digital formats via the outstanding (and growing) French label Krucyator Productions. Drawn and Quartered’s relationship with Krucyator Productions began in late 2017 when the label re-issued the 2012 album ‘Feeding Hell’s Furnace’ on digital and cassette formats. This relationship was strengthened further in April 2018 when Krucyator Productions re-issued the band’s 2006 album ‘Hail Infernal Darkness’ on vinyl for the first time ever. The artwork for The One Who Lurks was designed by Gabriel T Byrne who previously created artwork for all Drawn and Quartered full length albums. The One Who Lurks was recorded by Kelley Kuciemba along with Chris Manino who recorded the drums and was produced, mixed and mastered by none other than the highly talented owner of Krucyator Productions, L.F. who also designed the layout for the CD. 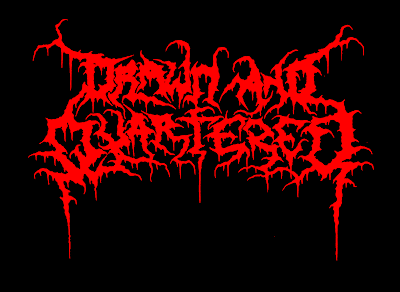 Drawn and Quartered’s lyrics are centered around death, murder, torture and Anti-Christianity and the band plays a very straight forward, yet highly effective style of traditional Death Metal. The music featured throughout the album features varied tempos from mid to high pace and has that stop/start nature that helps emphasize this variation in speed with some exceptional drumming from Simon La Dorfman maintaining these variations throughout. The production during The One Who Lurks is, as you’d expect, exemplary and is suitably cavernous without becoming too murky. This sound lends itself particularly well to this style of Death Metal and L.F. has perfectly captured an excellent balance within their sound, giving each instrument room to breathe whilst never drowning Herb’s low pitched growling vocal. With the entire album available to stream below there’s no need for much description of Drawn and Quartered’s music as the strength of it is instantly noticeable on listening. Whilst there are similarities with bands such as Incantation over their 25 year history Drawn and Quartered has patiently evolved their own signature sound with The One Who Lurks representing the culmination of this evolution to date. Drawn and Quartered is a long standing member of the American Death Metal scene and I’m surprised the band hasn’t received more acclaim and prominence as their music is certainly of a high enough standard, however, I’ve every belief The One Who Lurks will bring them further fans worldwide. A very strong album and if you’re a fan of the likes of Incantation and Immolation you’ll most certainly agree. A worthy addition to Krucyator Production’s significant and growing roster. 8.5/10. 08 - Portals of Communion. The One Who Lurks is currently available via Krucyator Productions by following this link.